On behalf of NGO Concern Worldwide, Beyond peace Cynthia Petrigh and Arsène Gassi conducted a field research in 3 provinces of the Central African Republic (CAR) in february 2018, in order to better understand conflict and gender dynamics in these regions as well as how communities cope with disaster. After surveying the 3 sous-Préfectures in Ombella M’poko and Lobaye, we ran a strategic workshop for the NGO expatriate and national staff and produced a contextual analysis, a strategy document and programmatic recommendations in view of integrating Gender, Peacebuilding and DRR. Unsurprisingly, in the surveyed provinces as in other parts of the conflict affected country, poverty, sever gender inequalities, conflict, poor access to education as well as the inconducive mining environment were found to be hampering communities’ development. At the same time, these communities experience a relative level of calm, or negative peace. While this is mainly due to the current control by one armed group only, it can provide the space for a transformative intervention. The question of the return of the Muslims inhabitants is still pending, as are the prospects for women’s participation. 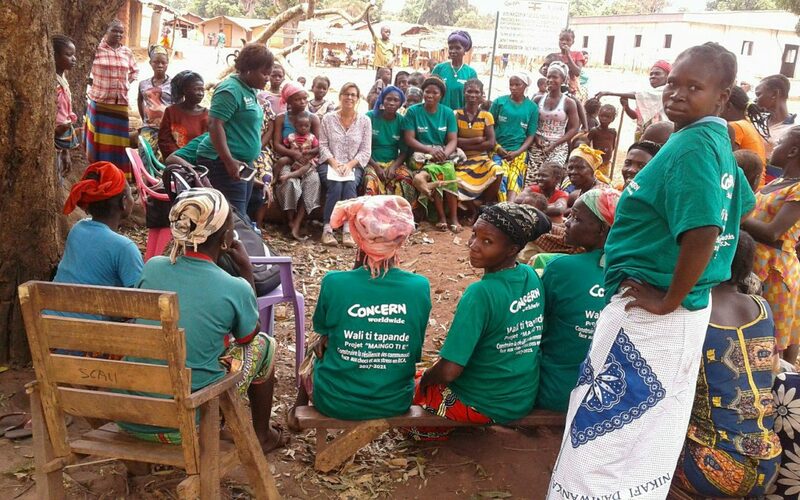 We wish Concern team full success in their 5-year programme aiming at enhancing communities resilience to disasters and conflict and fighting gender-based violence. This ambitious project complements other interventions in the region (WASH, Food for work, etc). The agency is well-placed to successfully implement this project, which could become a model for other regions in CAR. To put an end to abuse and raise people’s awareness about rights, we train combatants; we provide expertise in monitoring and investigating human rights and IHL violations, gender-based violence and international crimes affecting children; we accompany societies in transition by supporting mediation efforts, dialogue initiatives and women’s participation to peace processes. Advocacy in Brussels: are CSDP missions gender-sensitive?